We're glad that you found us. 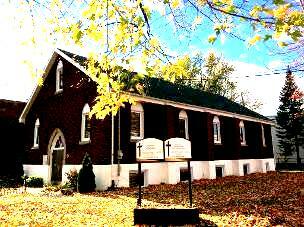 Westend Bible Chapel is located at 7611 Rue Centrale, LaSalle, Quebec. At Westend we are committed to the worship of God, to the building up of Christians for life and service, and to the proclamation of the Gospel of Christ. We are a Christ-centered, Bible- believing assembly that seeks to meet according to New Testament practices. Although independent, there are thousands of assemblies similar to ours functioning throughout the world. We hold to the historic truths of the Christian faith as revealed in the New Testament. On Sunday mornings we meet using the pattern followed by the early church as described in Acts 2:42 and meet for teaching, fellowship, breaking of bread and prayer. Our purpose is to glorify the Lord Jesus Christ as we gather to worship and serve our Saviour, to learn of Him and know how He would have us live, and to encourage each other to grow and become more like Him. The Great Head and Shepherd of the Church is the Lord Jesus Christ. Although we operate without an official pastor, our biblical eldership team provides spiritual leadership and along with others in the fellowship provide pastoral care and teaching. The ministry of the church is carried out by those who are in fellowship with the church and our motivation comes from a personal love for Jesus Christ and our heart's desire to glorify Him. We would enjoy the opportunity to meet you at one of the upcoming services!